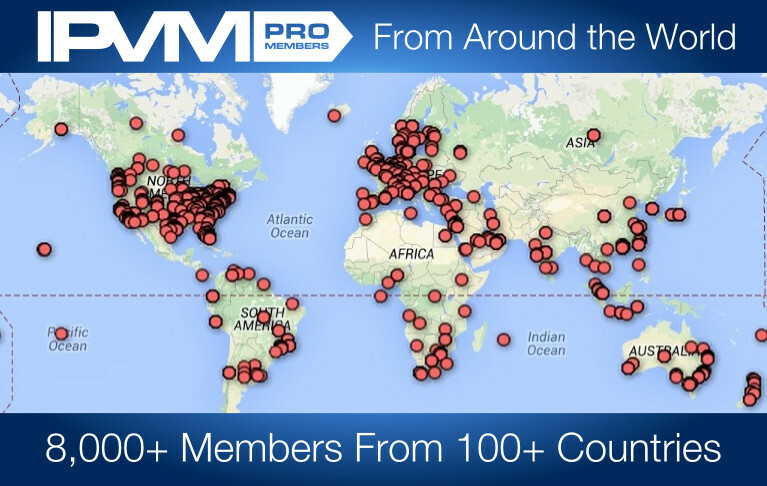 This map shows the locations of IPVM PRO members throughout the world. The map is based on member logins to the IPVM site. One of the great things about the Internet is how it enables global impact. Of course, in our industry, publications are typically concentrated / limited to a single continent only so it is a testament to what and how we cover that so many people around the world pay for IPVM. Indeed, despite us being a US based company, 75% of the top cities visting IPVM are from outside the US. We are going to use this to better customize our communication with members. For example, updates specific to certain regions, surveys about an area, news on events in specific location, etc. Additionally, we are looking at sending out newsletters at each member's local time so they are more likely to see it / not get it while they are asleep. For the techically inclined, we measured this by collecting IP addresses of member logins, looking up the location associated with each IP and then mapping those locations on a map. We used the Ruby Geocoder, the MapQuest API and a Google Fusion Table. On a simpler level, you can find the location of your own IP address by looking up your own IP's location online. Some limitations exist. Not every IP address is matched up to a specific city or precise area. For instance, the red dot in the middle of Siberia above. The geolocator evidently lacks precise locations within Russia and so simply picks a point in the center of the country. Likewise, in many countries, like Taiwan, a few dots are only shown for the entire country, with dozens of member logins all mapped to a spot, despite there being hundreds of Members. All in all, the geographic mapping provides a good overview of physical locations / diversity. One of IPVM's key areas of development is to better cover the world outside of North America. While it is great to see so many Members globally taking advantage of our core research and testing, we do want to further improve out service for the global community. If you have any ideas, feel free to share. That's pretty impressive and interesting. Thanks for sharing. I'm on another forum (gaming machines) that has similar. You offer "Some limitations exist." True. Including a traveler picking up an IP where they are at a point in time. Or is there a seconday check for device ID to offset? And, (my bane) an ISP the is in another state. :-( I get offers that never can apply. Hmmm, maybe that's a good thing. NOT! We analyzed IP addresses over time and picked a 'home' IP address that was most frequently used for each member. This was done to avoid the issue of someone going away on business for a few days and being recorded for a remote location. Isn't it stange that there are IPVM members in Mauritius, but none in Madagascar, seemingly a much larger market. It's 1 person in Mauritius, like we have 1 person who is a member from Tahiti (the dot in the southern Pacific Ocean). Since we don't 'market' to any specific area, it's somewhat random who finds us on the Internet via social media or Google, etc. As for Madagascar, it is likely related to the low English speaking population percentage. This is the main barrier for IPVM for a global audience - being English only. Hiphop, Hoohah! I am not regionally alone! This is the main barrier for IPVM for a global audience - being English only. If you are one of the 'silent serbs' that I see encroaching near my home dot, and you need to ask a question, you can send to me in serbian and i will email it back to you in english, mucho pronto! My email is tedorgligorich@gmail.com. Assuming this is ok with admins/lifeguards? My english translations and writings are often 'spotty' or 'right off the money', but they get the point across. Why the near boycott of our amigos to the south, save those in Tiajuana, do you suppose John? I read that the Mexico sister show to ISC west had some 12k people, and a few more cameras woudn't hurt 'em, right? Less than 5% of Mexicans speak English. We have a few dozen Mexican members but to get any substantial numbers would likely require a Spanish version of IPVM. Que lástima. Sería mejor traducir los artículos más populares. A lo menos, los hispanohablantes podrian leerlos, sino comentar. We definitely could translate the most popular articles. First, though, we would need to internationalize the app / site and then localize the navigation in Spanish. That's not terribly hard but we would need to dedicate some time to that. The languages that likely would be first are Spanish and Chinese. True, and that is probably enough. There are only 4 global languages: English, Spanish, Mandarin Chinese and Arabic. A majority of earth residents have a functional knowledge of at least one of those. I have not heard that before, are you quoting someone or is this an original epiphanic declaration? "...[English] Spanish and Chinese." ...that is probably enough. Easy for you to say, Si/No? It is becoming more and more apparent that these 4 languages are the only real international languages now. I'm not saying that other languages aren't worthwhile, but these are the languages that are spoken in mass beyond their home countries. People who do not speak these four languages natively, will choose one of these 4 as a 2nd language. If you don't have unlimited localization budgets, this matters. Either way, if you look at total number of native speakers, Chinese and Spanish comes in 1 and 2, ahead of English, so that it is a big draw in itself. Yes, and Hindi 4th then Arabic 5th, which is the real reason I initially questioned Jonathan when he seemed to omit the language of the Indian Snub-Continent. But now I understand what he meant. But even if you could translate reliably the tests and articles into Spanish and Chinese what would you do wih all the native language questions (maybe some native promos too!) it would generate? It is not anglo-centric at all, but rather the truth: If you don't already speak those 4 languages and you want to learn another, your overwhelmingly likely choice is English, because everyone else's is also (and you want to maximize the return on your efforts). I'm not saying it's right, but the military and economic hegemony of the British Empire and the United States over the last couple of centuries have made English supremely successful, and it feeds on itself. Languages with large native speakers will always be a force, of course, and everyone should learn a 2nd language regardless. Actually, we have a few dozen! Mostly concentrated in the Manilla area and the North though. Jedrick, thanks for checking in and being a member from the Philippines! John you left me out! :( Probably because I use a Corporate VPN that makes my IP from the US. You could post another map from your IPVM Professionals. BTW I'm from Guatemala, right in the belly of the Americas. Juan, great to hear! Thanks! Hello John. I am happy to see IPVM has worldwide acceptance. I am from Costa Rica. I work for main security products supplier in my country. I keep reading IPVM articles to guide our choice of CCTV products. It is good that English is language most technicians understand although it is not so easy to speak. And congratulations to John Hanovich and his great job. Hi John, very interesting and fun initiative! Leaving aside the possibility of being a victim of the sword of Damocles in the hands of the Big Brother, it's always good to see that we are all equal anywhere in the world: similar interests, funny comments different opinions. Could you please tell what's the top 5 or 10 for Central and South America? Augustus, there's a few dozen of members from the Philippines. Thanks and welcome!